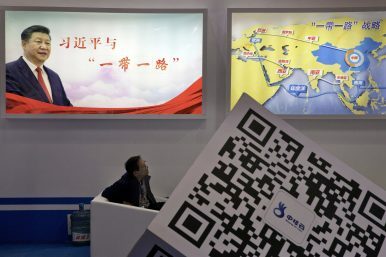 In this April 28, 2017, file photo, an attendee at a conference looks up near a portrait of Chinese President Xi Jinping with the words "Xi Jinping and One Belt One Road" and "One Belt One Road strategy," in Beijing. Over time the BRI could threaten the very foundations of Washington’s post-WWII hegemony. The nascent Belt and Road Initiative (BRI) illustrates the transformative geopolitical implications of China’s rise. Despite its changing contours and the fact that it partly recycles preexisting plans, this series of major infrastructure and development projects designed to connect Eurasian regions together is a coherent enterprise of unprecedented scale: $4 trillion of promised investments in 65 countries representing 70 percent of the world’s population, 55 percent of its GNP, and 75 percent of its energy reserves. The BRI aims to stabilize China’s western peripheries, rekindle its economy, propel non-Western international economic institutions, gain influence in other countries, and diversify trade suppliers/routes while circumventing the U.S. pivot to Asia. Of course, the BRI’s prospects of success are subject to many unknowns, including the possibility of foreign resistance, China’s domestic economic travails, political turbulence, aging population, and environmental problems. On the other hand, the U.S. still possesses enormous assets to maintain its predominance, including military primacy, multiple alliances, powerful Western-led international organizations, and an unmatched soft power. Yet over time the BRI could threaten the very foundations of Washington’s post-WWII hegemony. First, its naval dimension works in synergy with overland projects that span regions of critical geostrategic value, taking advantage of China’s central position along the Eurasian rimland. While U.S. leaders have focused on Beijing’s maritime buildup in East Asia, and while most analyses have derided its massive investments in poor and unstable parts of continental Eurasia, those initiatives are mutually reinforcing, part of the same grand design, which is to push the U.S. toward the periphery of the Eurasian rimland, thereby marginalizing its geostrategic influence. Second, Beijing seeks to offset the United States’ military primacy. Its buildup in maritime East Asia and the South China sea is worthy of attention but it is also designed in response to the U.S. naval presence and to the alliances that American leaders have nurtured along China’s southern flank since the early years of the Cold War. Regardless, this specific challenge should not absorb the bulk of the United States’ resources. For all of its military initiatives, Beijing’s key priority is to make strategic gains by leveraging its superior geoeconomic assets: vast and fast-growing market, full state control over the economy, and massive financial reserves. Third, to advance its interests, China exploits the cracks in U.S. post-Cold War hegemony. Washington’s interferences in Russia and Iran’s respective spheres of influence, and its military interventionism in the Middle East, triggered a nationalist and Islamist backlash that significantly diminished its resources and credibility. The unending global war on terror and misguided attempts at forceful democracy promotion only compounded this strategic overreach, while the militarization of Washington’s national security apparatus reduced its ability to tackle the deeper roots of those multi-dimensional challenges. In the meantime, China emerged as a near-peer competitor and began to project geoeconomic influence beyond its vicinity. This strategy has started to yield results in key regions of Eurasia. Chinese leaders have long aimed to freeride on U.S. Middle Eastern security architecture while preparing for its — supposedly — inevitable decline. Beijing has capitalized on Washington’s heavy lifting to ensure stable energy supplies and has exploited the widespread discontent resulting from U.S. military interventionism and regime change campaigns to befriend all of the countries of the region. Yet Iran constitutes its true priority. China has nurtured bilateral relations with Tehran for decades, leveraging a common resentment toward Western dominance. This partnership has great geostrategic importance to both nations. Thanks to its oil and gas reserves, Iran could help Beijing withstand a U.S. attack on its SLOCs (Sea Lines of Communication). More fundamentally the very existence of a powerful regime in the heart of the Middle East frustrates U.S. hegemony and diverts its attention and resources. The 2015 nuclear deal and Iran’s partial reintegration into the international community benefited all parties by dramatically reducing the risk of regional war. Regardless of the Trump administration’s withdrawal from the deal, short of a more ambitious normalization bargain, the agreement could not immediately repair the legacy of rivalry left by the 1953 U.S.-backed coup against a democratically-elected local government, Washington’s massive support to the shah’s dictatorship, and, following the 1979 Islamic revolution, its assistance to Tehran’s enemies and countless attempts to force the country into submission. By contrast, Beijing, which had capitalized on decades of coercive U.S. policies, took advantage of the nuclear deal to drastically increase its imports of oil and gas and to welcome Tehran in the AIIB (Asian Infrastructure Investment Bank), a rival to the U.S.-led financial order. Most important, it now seeks to use Iran’s potential as trade crossroads and as the cheapest route to export Caucasian and Central Asian natural resources — with potentially significant consequences for Europe — without encroaching U.S. and Russian spheres of influence. Beijing also made breakthroughs in South Asia and the Indian Ocean. The war on terror initially increased U.S. hegemony over the region. It allowed troop deployments and military-to-military partnerships in Afghanistan and Central Asia, in Russia’s traditional backyard and close to China’s Xinjiang province (strategically critical due to its natural resources, nuclear installations, and pervasive opposition to the communist regime). Washington went to considerable lengths to build a strategic partnership with India, an effort that paid some dividends despite limitations and ambiguities on both sides. The United States also initiated a thaw with Myanmar, along China’s southern border, and tried to launch a New Silk Road between Afghanistan, Central Asia, and South Asia to marginalize Beijing and other regional competitors. Yet China has largely extended its grip on the Indian subcontinent in recent years. It invested heavily in infrastructures and other strategic domains in Indian Ocean littoral states. It started the building of major overland routes through Myanmar and Pakistan to connect its mainland to local seas. The newly-created China-Pakistan-Economic Corridor (CPEC) might even be extended to Iran, Afghanistan, and Central Asia. The Trump Administration’s recent National Security Strategy endeavored to “help South Asian nations maintain their sovereignty as China increases its influence in the region.” Among other initiatives, Washington upgraded the profile of the Quad, a partnership that includes the United States, India, Australia, and Japan. However, the United States still reels from military overreach, relative economic decline, and domestic political gridlock. By contrast Beijing has used its considerable geoeconomic leverage to assert its strategic influence over Pakistan, Sri Lanka, Myanmar, and other states. As some experts noted, this could ultimately allow China to become a “resident power” in the region. A similar phenomenon is visible in Europe. For all of the United States’ efforts NATO’s post-Cold War expansion to former countries of the Soviet bloc and the launching of the global war on terror did not substitute for the foundational Soviet security threat that once undergirded the transatlantic alliance. The European states’ reluctance to increase military budgets and to participate in misguided U.S.-led interventions caused tensions, especially following the invasion of Iraq. Meanwhile China made important strides. Its regional trade and investments skyrocketed. Beijing acquired strategic assets to amass local advanced technologies and know-how, using Europe’s economic distress in the wake of the 2008 financial crisis, the EU’s political divisions and lack of an investment vetting process, and the mesmerizing appeal of China’s national market. Chinese leaders use their growing geoeconomic leverage to discipline their new partners and cultivate local proxies. The United States has tried to counter these efforts, as illustrated by the unsuccessful negotiation of the Transatlantic Trade and Investment Partnership (TTIP) and continuous attempts to harness European militaries and defense industries to U.S. strategic goals. Yet Beijing’s rise has started to corrode the depth and scope of transatlantic relations. Despite frustrations with its economic practices, European countries have been willing to develop bilateral ties further and further. Moreover, they have only very timidly endorsed the U.S. position that China’s growing assertiveness in the Asia-Pacific poses a major threat to the international order. Trump’s rejection of the Iran nuclear deal, economic multilateralism, and the Paris climate agreement make things worse, but the problems are deeper. Though U.S.-Europe relations have solid foundations, current trends are preoccupying. Over time, they could complicate military cooperation, hurt the United States’ economic interests, obstruct its strategic routes via the Mediterranean Sea and Suez Canal, and curtail its efforts to frame the global contest with China as a battle pitting Western liberal values against authoritarianism. So what should the United States do to improve its strategic trajectory in an increasingly multipolar world? Instead of remaining overwhelmingly fixated on the military balance of power in the Asia-Pacific, Washington should find effective ways to counter Beijing’s geoeconomic offensive across the Eurasian continent and its growing leverage among some of the United States’ partners and allies themselves. Furthermore, instead of perpetuating self-defeating interferences in Russia’s and Iran’s respective spheres of influence, which only push these countries into China’s arms, the United States should leverage their fears of Beijing’s growing power to constrain the its geopolitical progression; while the diplomatic overtures required by such a course of action do not seem palatable, in the long term Washington can simply not afford anymore to fight everyone at the same time without doing long-term damage to its economic and security interests. In parallel, U.S. leaders should engage Beijing to try to shape the BRI’s contours to their advantage, minimize the risk of war, and encourage cooperation in domains such as counter-terrorism and global environmental reforms. In the long run, China’s geoeconomic offensive across the Eurasian continent could threaten the very foundations of the United States’ post-WWII hegemony. Because of its narrow focus on the military balance of power in the Asia-Pacific, the United States has not yet developed the tools necessary to address that challenge. Adjusting to pursue a more realistic grand strategy would account for these realities and redirect resources to the appropriate means — a true “pivot to Asia.” This grand strategy would yield substantial short- and long-term benefits for the American people and the West. Thomas P. Cavanna is a visiting assistant professor of strategic studies at the Fletcher School of Law and Diplomacy. Prior to this appointment, he taught at the University of Pennsylvania and Southern Methodist University and was a Fox Fellow at Yale University. He holds a M.A. and Ph.D. in history from Sciences Po.